A simple recipe consisting of tortillas, refried beans, hard-boiled eggs, and salsa is meant to be a spinoff of the oh-so-popular Mexican breakfast, huevos rancheros. I've actually never tried the dish, as I'm not one to eat my eggs any other way besides scrambled, but I figured I'd give this recipe a try. The results were...eh. If you like hard-boiled eggs, you'd probably enjoy this more than I did. 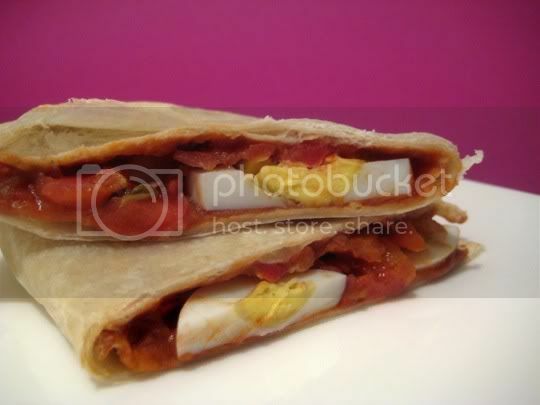 Basically, a tortilla is spread with refried beans, topped with egg slices and salsa, and heated until warm. Unlike the REAL huevos dish, there's no cheese, no cilantro, no ranchero sauce, no avocado. Boring! That being said, once I got around the hard-boiled egg taste, the meal was decent and satisfied my hunger. The eggs actually weren't TOO eggy, or maybe it was the refried beans or salsa that masked the flavor. The salsa I used was more of a pico de gallo, so maybe a different kind would have added a little more flavor. At least it was quick to make, and quick to eat. Make again? Probably not. Or at least I'd scramble the eggs, add some cilantro, try a saucier salsa, DEFINITELY add cheese, avocado...you get the idea.